QUESTION: I turned on my LCD TV and there is no sound coming from the speakers, how do I test it to see if its the built in speakers, a cable problem, or the TV itself? If your TV has a picture but no sound coming out of the speakers, there are a few things you can easily check. We are assuming that you already turned the volume up on your TV using the remote control and the buttons on the TV itself. See below for the best solutions to fix a TV with no sound. Television Has No Sound Answer 1: Make sure TV is not muted. Television Has No Sound Answer 4: Make sure there is not a pair of headphones connected to the TV audio out jack on the side or front of your TV. Television Has No Sound Answer 6: If you have a receiver or surround sound connected to your TV, turn it on and see if you get sound coming from the external speakers. Television Has No Sound Answer 7: Turn off the TV, cable box, and anything else connected to the TV. Sometimes turning everything off and then back on can fix the problem. 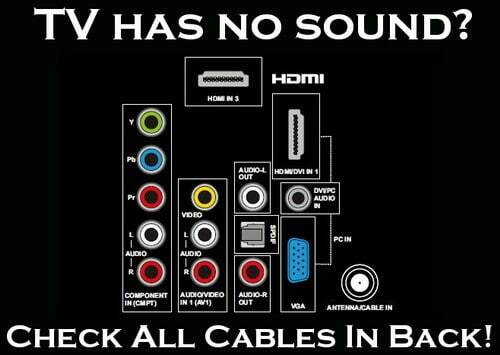 Television Has No Sound Answer 8: If using an “S” video cable into an input on the back of your TV, these cables carry no sound, just video, so make sure you connect an audio cable too. Television Has No Sound Answer 9: Hook up an external device to the “TV audio out” input. This will be the test to see if it is a TV circuit board malfunction or the speakers are faulty in your TV. Television Has No Sound Answer 10: If you are connected to a satellite box, use the included remote and go into the “menu”. Check to make sure sound settings are set correctly. I can’t begin to thank you for your 10 tips. I followed them and finally just shut off the cable box and brought it back up and , success! SOUND!!!! I can’t begin to tell you how overjoyed I was. I live on a fixed income and have no means to buy another TV. Your tips are da bomb! TYSM. I am bookmarking this website. I have a Panasonic TV. Have a great picture but no sound. I dont know how to check our secondar audio protect (SAP) or the “menu” sound settings. I used the advice from her to fix the sound on my TV, after checking out all the things you have suggested to try I seen where several people disconnected everything for 5 min then started all up and sound came back on. Thank you, saved me from major expense! Sound on my Plasma fades out after 50 mins. It’s not any external box (console, cable etc) it’s the TV itself. Would you say it’s the main board or logic board that these things go out? My 55in Polaroid tv has a great picture, but no sound. I’ve tried the steps mentioned to re-set the sound to no avail. What do I do now? Please help! I have a RCA LED HDTV. I was playing a game on my PS4, and switching from HDMI input 2 to HDMI input 1 where my digital cable box is to watch TV. The audio cut out on the TV and the same as I switched back to HDMI 2 for the PS4 when I was about to turn it off. Both HDMI input channels don’t have audio now, though the TV itself does, as when I switched to the Component input it works just fine. The model is LED32G30RQ, and the specific serial number is 4431-LE32G30-B206867, if that helps at all. Says on the back it was made in September 2014, and it’s just out of warranty service time, wouldn’t you know! Though, that doesn’t matter, because I called all the numbers I could find on the RCA site that have to do with customer service and they either flat out don’t work, refer you do a different number, or are a robot telling you the number is no longer in service. And, I’ve tried all the troubleshooting methods that you’ve listed on this site already, nothing helped. Any other suggestions would be appreciated. OMG! The sound on my tv wasn’t working & followed your tips…unplugged everything & waited about 5 minutes & the sound is working now!!!!! Saved me a lengthy service call & thought I’d have to have someone come out & look at it. THANK YOU SO MUCH!!! Thanks, unplugged and replugged and everything worked. I was surprised, it never happened before in 5 years! I have a 42″ Vizio TV modelE422VA that has picture but no sound. Have tried all 10 steps with no luck. Any other options or is it garbage? I have a 47″ bush TV when I am watching it the sound cuts off and I need to turn it on to standby and back on again for the sound to come back on but it only lasts a few minutes then cuts back off anyone any idea what the problem is??? I have a 2011 RCA model TV LED24A45RQ. I recently plugged my computer into the tv via a hdmi cord. Now, the sound does not work on the tv. If I stream through my computer, the sound works. If I stream through my blu-ray, the sound works. If I only use my cable, it won’t work. It has always worked before. I have tried a factory reset but nothing. I have tried both remotes (cable and tv) and there is very limited options to try…thus the factory reset. I tried step 7 and it worked. I have an Insignia 40 in flatscreen, and during a storm the breakers on the house popped after resetting the breakers turned on the tv and no sound. I have a great picture just no sound from the internal speakers. However i get sound if i plug in my headphones. I’ve tried all the steps listed, but to no avail. It sounds to me like there is an issue with the internal speakers but i’m not sure where the issue might be, or what i can do to return sound to internal speakers. Many thanks, I followed tip 7, turned my TV off then back on again and lo sound was restored. The only thing that puzzles me is why it vanished in the first place! I have a Toshiba TV. There is a picture but no sound while the tv is playing. However when we play a dvd there’s sound. 42 inch RCA TV. ABOUT 3 YEARS OLD, BUEATIFUL PICTURE BUT NO SOUND. My Samsung hdmi LED TV has only video but no sound. What could be the possible error? Try all of the above methods for fixing your Samsung LED TV that has no sound… After trying all of the above proven methods, let us know the result and we can assist from there. Sir, I have a Samsung Smart TV, with sound problem when choosing cable or Antenna options. I don’t know if this kind of TV needs a digital box or not. The TV audio is perfectly working with AV’s, USB devices, and internet. I have already detached all connected devices to the TV and tried connecting the Antenna wire to no avail. It has pictures but it has no sound with TV. Please help. I have a JVC LCD TV with built in DVD player. When I switch the TV on i do not get any sound. I have to switch the sky box and tv off at the mains which seems to rectify the issue. Does anyone know what the likely cause would be? The problem is either with the TV or the SKY BOX. What happens if you turn the TV on and reset ONLY the SKY BOX. You need to find out if the TV is the issue or the SKY BOX is the issue. I just bought a new Samsung LED smart TV – un40j5200 – and i’ll be sitting watching tv and the sound will go out. I’ll back out of the app i’m in – go back to the same show, the sound will come on for a few seconds but go out again. There is NOTHING plugged into the back of the television as the only thing we have is internet here. no speakers – no hdmi devices, etc… help? This is sporadic though. Could it be the internet connection for whatever reason? I can make it through a whole show sometimes before this happens – if it happens at all that session. It could be the internet with a certain type of buffering issue which makes the sound intermittent. The TV sound board may be faulty, but you need to test things to be sure. You may have a loose ribbon cable issue in the TV itself. Try a test by plugging in a DVD player or similar and watch a full movie, if the sound is fine, then the issue is with your internet or app you are using to watch TV. Is your internet speed fast enough for NETFLIX or whatever you are streaming? Make sure. I have a smart Samsung TV 46 inches 3D HD series 8. It has excellent picture but only has a buzzing harsh unclear sound. The problem will disappear if I use an external speaker. I live in Canada Mississauga and the device was actually shipped to Canada. You may have blown speakers on your Samsung TV. If you hear a buzzing noise and the sound is not clear, you may want to inspect the internal TV speakers. NOTE: It could also be a sound board issue or a wiring/ribbon cable issue. You will need to have a look to find out. I have a 55″in Sanyo TV with picture but No sound. I use an HD Antenna for local channels. I recently bought a speaker to connect it to see if it would work. Well to my fortune it does but only with my DVD and PS4, Sound does not come out on my local channels. Why would that be? Need help! If your Sanyo 55 inch TV produces sound with your DVD and Play Station 4 PS4 but not with local TV channels using an antenna….. Try and find any firmware upgrades for your Sanyo TV. It might simply be an issue with the TV needing updated. Also, when no sound is produced from your TV when using an antenna, then that means there is a weak or low signal. Is your antenna one of those indoor HD antennas or do you have an outdoor antenna? I have a LG LCD TV (model number 42LE5900) and while watching TV the sound just went off. Tried resetting the audio in the menu settings, which didn’t work. Then reset the TV back to factory settings, which also didn’t work. Then unplugged everything and plugged everything back in and the sound still didn’t work. Tried playing a DVD / game through the x-box which still had no sound, all the cables are connected correctly. Am I thinking it going to be the sound board in the TV, if so is it terminal or is it cost effective to replace the sound board. Any help advice would be gratefully received. Yes sir, it sounds as if the sound board has malfunctioned. If you determine it is bad, here is a good place to get LG TV parts cheap. Thanks RR, I’ll have a look. Is it specifically a sound board i need or would an AV board or a mother / main board replacement sort the sound as well. Also does it has to be an exact match for the model number or is there a compatible model I can look for please. Again, any advice / info very gratefully received. Yes… try to find the EXACT model number when replacing a board in your TV. If you cannot find the exact MODEL number, do research to see if a model number close to your specific TV model might have the same exact board. OK RR, I’ll have a go at finding the correct board and let you know how I get on, thanks for the advice. I have an old Maxent flatscreen that I found on the side of the road, and I have an xbox connected with a HDMI to VGA or DVI (i can’t remember which one) cable. The sound doesn’t work. Is there anything I could do if the TV does have a messed up motherboard? You may have a bad SOUND BOARD. It’s an old TV so you may have to search on possibly eBay for a new board. Have you tried other sources for sound? Other cable, inputs? I received a NEC brand tv from a local sports store as they were replacing them with newer ones. The tv in question has a picture, but no sound. I tried the setting on the menu remote and there is no problem there. Could my problem be that I need to purchase a sound bar, or some audio cables? this really has me puzzled. The tv was one of several that were on the wall and I believe the sound was fed to the sound system in the store. If your NEC TV has no sound and you checked the audio setting in the TV menu, You could buy a sound bar, use new audio cables, factory reset the TV, or you may have a bad sound board. I have a Hisesnse TV, When playing animations cartoons from external it sounds great but when we play movies from the same device, it has no sound. What do you think is the problem here? What device are you using to watch cartoons and movies on your HiSense TV? If the same exact device delivers sound with one particular show and not another, that means the component is working but there may be issues with the movie itself. Does this happen no matter what type of movie you watch besides cartoons? Have you tried going into the menu of the component and adjusting the sound settings? I have an LG LED TV MODEL NO 32LN5110-TB, There is no sound coming from my TV DURING USB PLAY/HD. I do not have attached external speakers, only using TV speaker. Do you get sound out of the TV speaker if you switch the LG TV input to another component? My Vizio HDTV is making a strange sound. Sometimes sound is perfect then it almost starts making that sound and audio goes. Don’t know if it’s me but it sounds like sparks. Should i be concerned it’s a fire hazard!? Is your Vizio TV connected to surround sound or a soundbar? Is the weird sounds coming from the speaker or inside the TV? The sound sounds like an electrical problem? Is the TV hot or warm? Does the TV screen look fine despite the noise? Have a JVC 65″ CRT TV that we had for 12 years with no problems, then today there is no sound. Have checked everything, connections and menu setup and still nothing works. Any idea? If needs to be repaired, what it cost? Have you tried the simplest reset method by unplugging it for 10 minutes or so? Can you connect a component to the audio out jack and see if that produces sound? Do this to see if it is a board issue or just the TV speaker. I have a Vizio Smart TV. It was playing good earlier, and when I left out the room and went back a few hours later, my sound was gone, but the picture is showing good. What do I do? Most likely if you didn’t touch anything and your Vizio TV just stopped producing sound…. possibly the component you are watching (cable box, dvd, sat box) has an issue. Unplug everything including the component you are watching and the TV. A reset of everything should fix the issue. If not let us know and we can assist from there. We have a Sony TV, the sound went out suddenly during the time we were watching. We have a sound system and all the connections seem connected well. The sound system works well with other devices, such as iPod. When switched to TV speakers, the TV does not have sound either. We could not hear anything either using an earphone connected to the TV. We did reset, restarts a few times with no charm. Appreciate any suggestions. Thanks! Most likely you have a cable or wire that is faulty. Check all cables and connections and if in doubt replace the cable or connection in question. If the TV speaker does not work, try going into SETTINGS, SOUND, SPEAKER… and make sure it is ON. I have a Intex 40fhd10 TV and sound is going off after watching the TV for 10 min. If I switch off the TV for more than 30 min and then turn on the TV then sound is coming back but then going off after 5-10 min again. While sound is off, if I move the TV little bit, sound is coming back, but as soon as I leave the TV, sound is good off again. Do you feel it as loose connection inside? Yes sounds as if there is a loose ribbon connection or possibly bad sound board. Dear all, I have read through all the posts, but cannot find the solution to my problem. I just bought a 55″ Samsung smart tv, to replace my old perfectly working Sharp. None of the tv channels have sound, but when I play movies from the hard disk connected to sub, it works great. Also YouTube works fine. No other devices connected, just a black cable coming out of the wall, so no satellite or modems or whatever. On my remote I have no sap or mrt button. I know my sound is going out on my TV…..Because the volume comes and goes and fades in and out ..My QUESTION is …Can I buy a sound bar setup to replace my TV Volume..Will that fix the problem so i can hear my TV??? Yes if your TV has an “audio output” you can buy a sound bar and connect it the the audio out on your TV. What is the make and model of your TV? Take a picture of the audio out on your TV when you go to buy the sound bar to be sure the one you buy will connect properly. The sound is complete static on anything you watch? What is the model number of your old school Toshiba TV? I can hear the sound a little from one side of the TV. It’s not on mute and the volume is on 50. I tried the cords but it only helped a little. You can hear it but just not like you want it. It may be the component you are trying to use to watch TV. If after some troubleshooting you find the external components (DVD, Cable box, SAT box) working and the cables are not damaged and they are plugged in and secure, then try a factory reset on your TV and that MAY solve your issue. If not you may have a bad speaker or bad sound board in your TV. What make and model number is your TV? The last time I spoke to someone they advised me to obtain a new remote……I did and I have the same problem. On the TV, it’s written in RED ”NOT AVAILABLE”! This sign is always on. Try the Toshiba TV Remote Codes page and see if some of those remote codes will work with your TV. Thank you for your help! It solved my problem! I have a Skyworth 40 inches TV. I am trying to connect my DVD player and it produces pictures but no sounds. I can’t use the HDMI cable and also i tried using headphones on it but still no sounds what should i do? If the TV sound works when watching anything else besides the DVD, then go into the DVD menu and be sure the sound is set correctly. You may also be using just a cable for video and not audio. If you cannot use the HDMI, then you are most likely using the 3 wire which consists of Yellow, Red, and White. Correct? The Yellow is for Video. The Red and White are for Audio. Make sure all 3 cables are plugged in. Did you manage to get a fix for it? I also have a 40 inch Skyworth TV and I have experienced the same issue. I got a LG tv and some times the speakers will work, the next minute they go off. How can I fix this problem it works with a fiber optic cable all the time? If the fiber optic cable brings sound to the LG TV and the internal speakers work fine, are you using a different cable to bring sound otherwise? Try replacing the other audio cord. If you have intermittent issues with your TV speakers, you may have a board issue or possibly the timer on the TV for sound is set to turn off. I have Tecknika 22″ HD DIGITAL LCD TV/DVD everything works except the volume. Can you give advice? Or is it time for a new TV? Have you gone into the settings to be sure the speakers are not turned off? Do you have any stereo receiver or sound bar connected to the TV? Tried everything above but it didn’t solve my problem. I have a Proline LCD tv and when I switch it on, the picture is there but no sound. If I leave it for about 15 minutes switched on, the sound comes on eventually by itself. I have DVD player and VHS player and a Freeview box all connected. Everything was working fine until I connected a Chromecast to the HDMI socket. It all worked perfectly for about a week and now all of a sudden, the last four days, there has been no sound from the tv when I switch it on. I can get sound if I plug a separate speaker into the headphone socket, or if I wait, it does come on eventually. I tried unplugging the Chromecast completely, and now the tv sound comes on when I switch it on but when I switch the Freeview box on, the sound takes ages to start. I’ve wasted so much time trying to get the sound to work properly, nearly tearing my hair out, it’s so maddening! It sounds as if you have an issue with the sound control board in the TV. If you have to wait for the TV to produce sound, then the sound processing board may be on the fritz and may need to be replaced. You could also have a bad wiring connection to the sound board or speakers. Use caution when opening up your TV to work on it. Unplug TV and wait an hour before opening up the TV to troubleshoot the problem. Let us know what you find. There was a strong wind in our area suddenly my TV screen went dead, no sound, no sound but I can see white flicking lines in my TV Screen, what might be wrong in my TV? Do you happen to have SAT TV? If so the satellite dish is probably disconnected or the Dish is not positioned properly. If you have cable the coax have be damaged or disconnected outside. Have you tried switching the INPUT on your TV to watch a DVD and see if the TV gets a picture and sound? This will tell you if the TV is bad or just the component you are trying to watch is bad or disconnected. after an infuriating 2 hours of picture but no sound it was step 7 that worked in the end……Switched off everything including mains power and hey presto the set sprang back to life with sound..
We have a Pioneer plasma pro and receiver. We have connected both to the cable box and DVD player successfully…for picture. But cannot get sound. Any suggestions? Check ALL cables, check to be sure the cables are connected into the correct inputs and outputs. Make sure that nothing is MUTED on TV or receiver. Are you trying to use surround sound with the receiver or do you get no sound from the TV speaker? Bought a 40 inch Toshiba TV 2nd hand but can’t get any sound, there isn’t a remote with it but used old universal one, as a women and not very technical not sure what goes where at back of TV can anyone help. Are you able to use the universal remote with the Toshiba TV? If so go into the menu and make sure the SPEAKER in the SOUND settings are ON. I had an issue a couple of years back with a Toshiba TV with no sound but picture. Tried all the usual things as listed above to no avail so had to phone Toshiba as was just inside the warranty. They suggested to rescan for channels as the TV needs to update periodically. Tried it and it worked. I assume this is some sort of “feature” although slightly annoying. Has happened one since and a rescan sorted it again. Thanks for all your advice, but I have a problem with my sound on my TV. I have an old Vizio LCD TV and was hoping not to get a new TV if I can help it. Yes most likely the speaker was turned up or it is defective and is blown or the wiring is bad. Try using a different audio output jack and hook up surround sound or a sound bar. If the audio output jack does not work, then yes you may need to turn the TV speaker off in the menu. If nothing works to get your TVs audio working, the audio board in the TV may also be bad. It may be best to buy a new TV as replacing boards in a TV is hit and miss and the time and money you waste to fix your TV could be invested in a new TV. Do some further troubleshooting and you may get the TV audio or sound to begin working again. I have an LG TV. The volume was cranked up all way while playing with the WII. I hear a crackling sound. I unplugged the whole system, reset the sound settings, etc. 1) How can I fix it? 2) If I buy a soundbar, will it work? 1 – If the sound is crackling, then the TV speaker is probably blown. You could buy a new aftermarket speaker and install it in your LG TV. 2 – If you buy a sound bar, it will work as the problem seems to be with the TV speaker itself. A sound bar will connect into the audio input and you should be able to have sound this way if the TV speaker is blown. None of the above worked for me so I just unplugged the tv from the wall and then plugged it back in and it worked. I a Toshiba and i was playing my ps2. Once i boosted my volume and it crackels. Now my TV isn’t making any sound anymore. I’ve changed the cables many times but still doesn’t make any noise. But the volume comes on for awhile. Then it crackles and then back to no volume… is there any explanation for this? You may have a loose or damaged wire on the audio board inside the TV. If changing audio cables does not work but you hear the TV volume for a moment, then it may be the audio board, a loose or damaged wire or the speaker itself is damaged. You will have to do some troubleshooting to find the exact issue. What is the model number of your Toshiba TV? We have a Proscan that started having issues on the turning on of the T.V. Once on there is no sound. If you have tried all the above steps, you could try unplugging the TV and plugging back in. If that still does not work, you may have a speaker that is not working, a loose or damaged wire harness in the TV, or the audio board may not be operating properly. Further troubleshooting will be required. I have a Toshiba Smart TV and step 7 is the one of choice. I powered off all devices and also unplugged my surge for approx 20 seconds. I still have no sound. Are you using any type of external speakers with your Toshiba Smart TV? If so check the surround sound component to be sure it is set correctly. If you have no external speakers, have you gone into the TV settings and made sure the internal TV speaker is ON and working? Tried different sound settings? Are you using the correct remote control to set the volume? Are you trying to watch a DVD or CABLE and there is no sound? Try switching the input to CABLE, SAT, NETFLIX, DVD, or any other component to be sure that it is the TV having the issue and not an external component. If the TV speaker does not work no matter what you try, do an experiment and connect an external speaker to the TV to see if sound will be heard. If not you may have a circuit board issue or possibly the speakers in the TV have a wiring issue. Try everything first before taking the TV apart to check the speakers. Usually it is a simple solution and does not involve taking anything apart. Please let us know if you have sound from your TV or not and we can assist further if needed. I have a Hisense TV and the picture is fine. Neflix, YouTube, Pandora all have sound. My Cable does not. What should i do? Go into the menu settings of your cable box and make sure the audio is set correctly, if it is then check that the cable going to and from the cable box is not damaged and it is connected to the cable box and the TV. Some cable boxes have a separate audio cable, most do not. Check all wires and be sure they are connected. You could also try using another input on your TV for the cable box if you are getting no sound. Let us know what you find and we can assist further if needed. My 40 inch HiSense TV has just stopped producing sound or I can say volume. Previously I used a USB memory stick playing music. After 50 seconds it just stopped producing sound. I changed it and wanted to check if whether under a TV mode it has a volume. None was showing its playing pictures on TV perfectly but doesn’t have volume. Turn the TV off, unplug it. Turn it back on after about 5 minutes and check to see whether the volume and speakers work. If not, go into the TV menu under sound or audio, check to be sure that the TV speaker was not turned off somehow in the menu settings. Adjust audio settings until the sound comes back on. This should fix your HiSense TV to have sound. I was just about to phone the repair man as I had no sound as a last alternative I dropped onto your website and as advised I switched everything off you view box etc, anyway everything worked perfect after that I cannot thank you enough cheers and keep up the good work. Thank you so much! Your options really helped. The sound came back after i switched off all the switches. There is no sound coming from my TV. I have a sound bar and box. Can you help me? Have you tried unplugging the sound bar to see if TV is playing sound? Are you using the wrong remote? Have you turned off TV speakers when you hooked up sound bar? Go to TV menu and look in “audio” or “sound” and be sure speakers are not OFF. If no sound from sound bar then make sure sound bar audio connection is connected and secure. I have the identical problem. 6 year old Envision LCD. Just started a few weeks ago. Tried external speakers hooked to audio – out. Still no sound. Would sure like to hear some ideas. On some older LCD TVs, the built in TV speaker has to be off for the “audio out” jacks to work on the back or side of the TV. Give that a try in your “menu” section. If still not working then the sound board in your TV is probably fried. If you know anything about electronics you could remove the back of the TV and look for obvious signs of a “burnt” board. The sound on my TV is not present at first TV ON attempt but after repeating ON and OFF switch 2-14 times the sound comes on and functions normally. Any suggestions? Thanks! I was able to fix the sound! It was a cable! !